Editors: Rajendram, Rajkumar, Preedy, Victor R. and Patel, Vinood B. 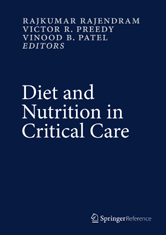 Diet and Nutrition in Critical Care is a three volume set which addresses the needs of all those concerned with diet and nutrition in the critically ill and covers General Aspects, Enteral Aspects, and Parenteral Aspects. Each volume is stand alone and is further divided into separate sections.